My grand daughter has a birthday coming up soon, and I wanted to make her something special. She will be 14, and the only one that takes after her grandma so far. She loves to create, (she is a painter) and she thinks her grandma can make anything. Last month we went to visit my daughter and family, my grand daughter asked me to make two necklaces, one with a key charm the other with a lock charm. Both with a metal tag that says Besties. She wanted the necklaces for her best friend, and herself. I forgot to take a picture (maybe I can get my daughter send me a picture later) but I must say that they turned out pretty cute. While we were there visiting I noticed she was wearing a necklace with an owl all the time. 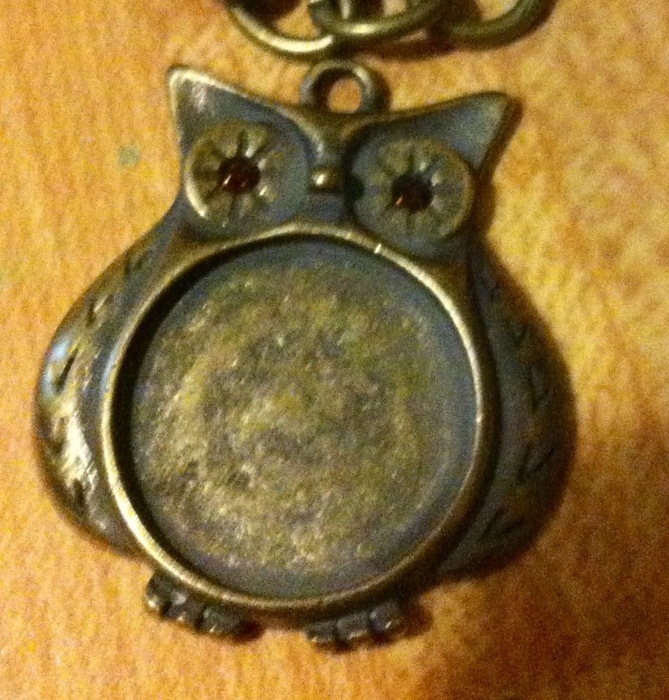 My daughter said she loves owls, and that is her favorite necklace. Well it just so happened while I was at Hobby Lobby one day, checking out the clearance aisle I ran across a cute little owl charm. I bought the last two. As you can see in the picture above, the belly of the owl is made to hold a stone or something. Well I didn't have a stone to fit, so I had to think on it a little while, then came up with Mod Podge's Dimensional Magic. Now all I needed was something to add to it. First I thought about seed beads, I could crush them and sprinkle around then fill with Demensional magic, but was afraid that might not look good. Finally I decided to put a piece of scrapbook paper for the background, then place a few words from a page of an old book (that I use just for that purpose) on top of the scrapbook paper, then I added my dimensional magic. What would you have done? 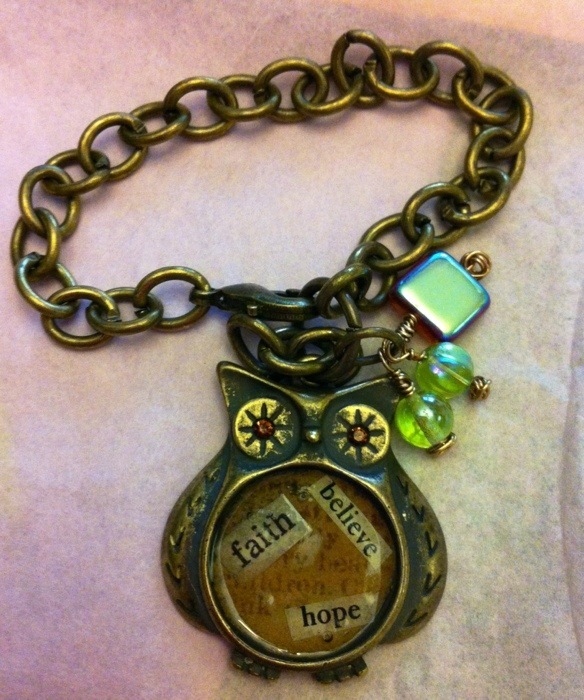 Would you have set a stone in the belly of the owl charm? Any ideas? I still have one more charm to go. My daughter and granddaughter loves owls. Thanks for the post. Hi Susan! Thanks so much for stopping by!